Ingredients: Aqua (Water), Lactococcus Ferment Lysate, Bisabolol, Glycerin, Ethyl Linoleate, Hexanoyl Dipeptide-3 Norleucine Acetate, Myristoyl Nonapeptide-3, Yeast Extract, Soy Amino Acids, Pseudoalteromonas Exopolysaccharides, Lecithin, Sorbitan Isostearate, Isohexadecane, Hydroxyethyl Acrylate/sodium Acryloyldimethyl Taurate Copolymer, Polysorbate 60, Polyacrylate Crosspolymer-6, Trisodium Ethylenediamine Disuccinate, Sodium Salicylate, Citric Acid, Sodium Chloride, Potassium Sorbate, Sodium Benzoate, Pentylene Glycol, Ethoxydiglycol, Phenoxyethanol, Chlorphenesin. Originally I had planned to do a brief overview of the three newest products from NIOD but since there has been so much interest in this one, I thought I would single it out for a more in-depth ‘First Impressions’ post. 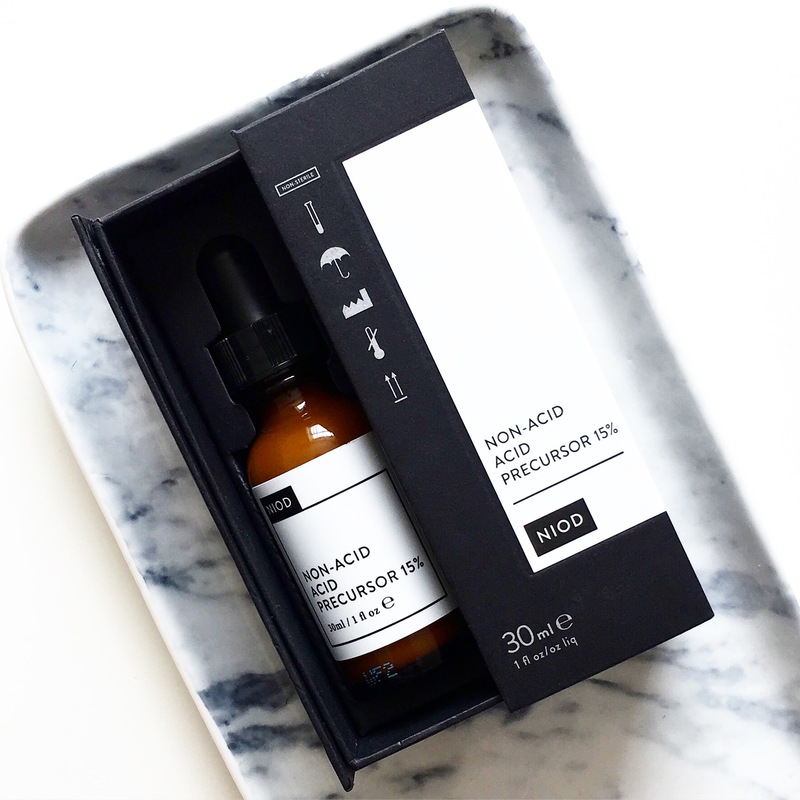 NAAP is NIOD’s answer to the traditional acids and retinoids out there, which the founder Brandon Truaxe believes provide short-term value that is not worth the inflammation caused. This could not have launched at a better time for me because for the past few weeks I have drastically reduced my acid usage and surprisingly, but also not so surprising, the improvement to my skin is big. Since using NAAP I am so on board with the non-acid exfoliation movement and love how my skin behaves. To give you some background information on my acid use, like a lot of you, I believed that acids were the key to good skin and my goal was to work my way up to higher strengths to continually see improvements. For a long time I used Pixi’s Glow Tonic and then moved on to Bravura’s Ginseng Toner and eventually made the leap to the 10% Glycolic Acid Peel that I would use pretty often as a toner/serum. This worked really well for me in the beginning and I loved how my skin looked. The issues arose when I moved on to Bravura’s Glycolic Acid 15% Night Treatment. The morning after I used it my skin was soft, smooth and looked even and bright. I was really pleased with the results until that is, I saw my skin in direct sunlight. I was shocked. Underneath the surface my skin was incredibly inflamed and bumpy and it looked like I had acne all over my cheeks. I couldn’t feel it and I couldn’t see it but the irritation and inflammation that the glycolic acid had caused was 100% there. Immediately, I remembered what I had read on Caroline Hiron’s NIOD post (below) and it all clicked. Brandon was right – acids were doing more damage than good for my skin, so I completely scaled back my usage and stuck to the amazing Votary Toning Serum, which is extremely gentle and non-irritating. With that my skin went back to normal thankfully but the whole experience really had me searching for an alternative to acids so when NAAP debuted it was a real “hallelujah moment” for me. So on to the product itself! I have been using NAAP for about 10 days every night and so far, it’s been great. No breakouts, no reactions, no irritation and certainly no inflammation. My skin has been soft and smooth but more importantly, consistently calm and balanced. As I said before, NAAP is designed to be an alternative to acids and retinoids and exfoliate the skin using “friendly” bacteria, peptides and amino acids etc (below) that will resurface the skin without causing any irritation. 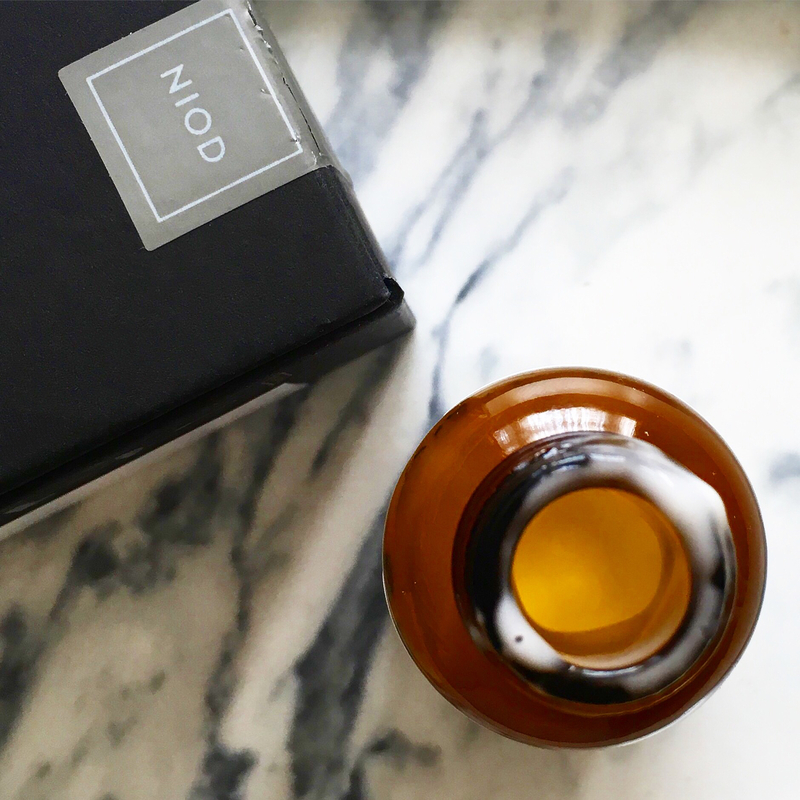 As with everything from NIOD it’s a new and novel approach to a beauty industry staple and I’m excited to see how this performs in the long term. One of the things that makes NAAP so different to the typical exfoliating or resurfacing acid products is that it has a cream-serum texture so it feels very comfortable on the skin and isn’t drying at all. I also believe that the hydration it provides is the key to its great results because it helps keep the skin balanced, which is very important. It is very gentle and quite soothing, although I did feel a tingle on the first few nights I used it and I took that as a good sign that it was actually active enough to do the job of acids/retinoids. It almost feels like a gel moisturizer on the skin so it’s thin and light and absorbs easily leaving behind a smooth finish. It’s not sticky and it doesn’t feel tacky, which means it layers really well with other products. Bizarrely the scent reminds me of the “safe” glue we used to have in school, so while it’s not all nice and herbal/floral-y, it’s definitely not unpleasant either. NAAP would work really well with all skin types but in particular, those who are sensitive and can’t use acids would really benefit from this. As you can see from the picture below, the only thing that doesn’t work is the packaging. A pipette is not right for a creamy product because when I pull it in and out of the bottle the product gets caught at the neck and spills out over the edges. This product needs a pump to make it easier to dispense the right amount but also to prevent this type of spillage/waste. This isn’t a deal-breaker for me but I really hope they change the packaging. 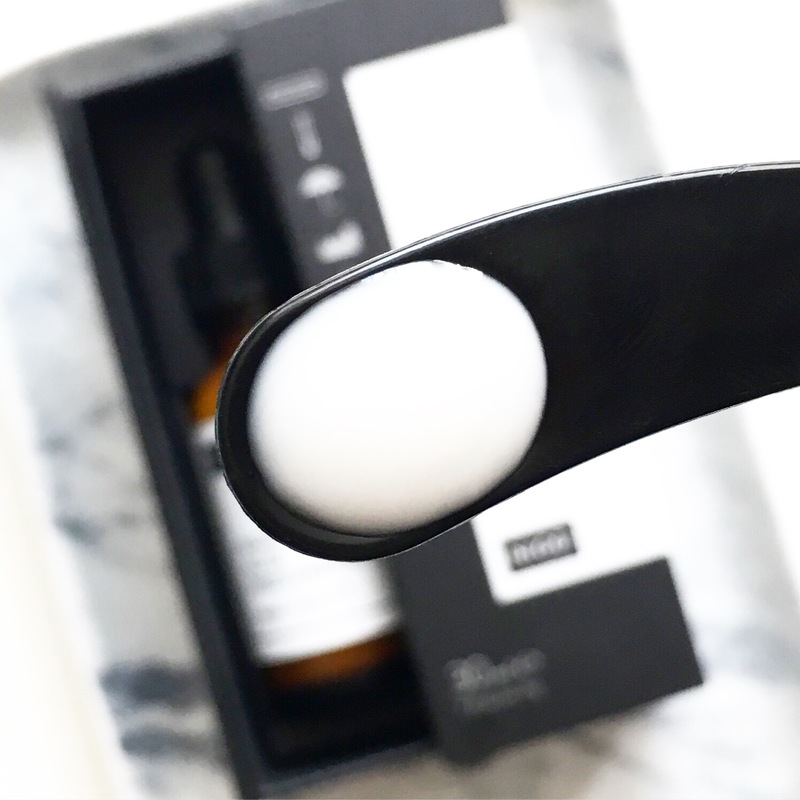 NIOD recommend using this in the evenings after CAIS (review here) and MMHC and I have been using it either after CAIS or immediately after cleansing on clean skin. For me it has replaced my “acid toning” step so I cleanse, use NAAP, spritz, apply a serum and then use an oil or balm (see Instagram for examples). 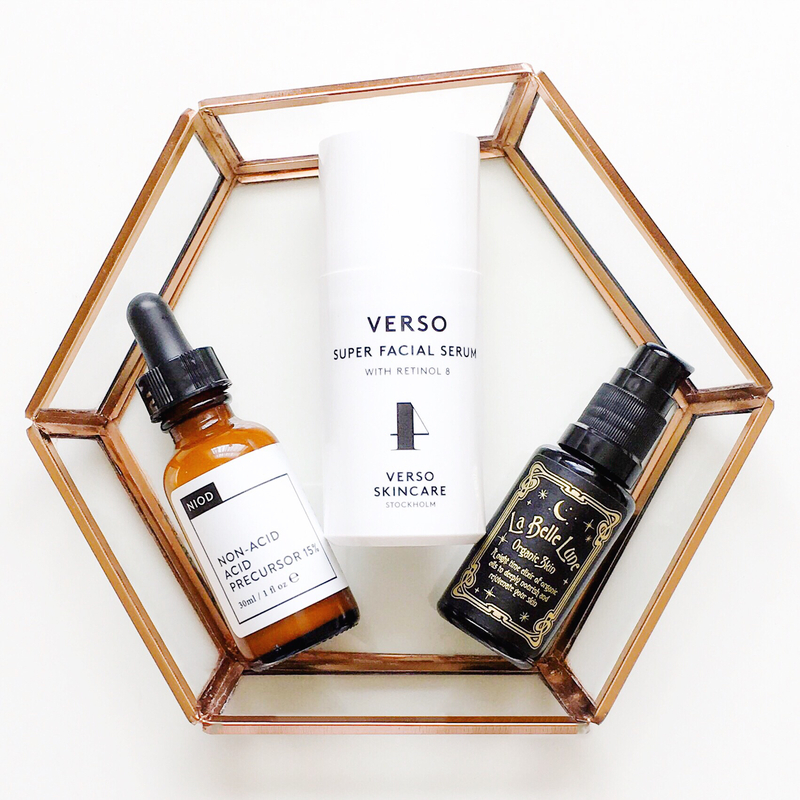 Even though this is also supposed to replace retinoids I have used it a couple of times with my Verso Super Facial Serum and I loved the two together. I have seen great results with this product so I don’t want to give it up just yet but in a month I will also take a break from using it and see how NAAP works on my skin without any acids or any retinols. For now, my favourite combination is this one below and results of these three together have been amazing. It might be hard to think about giving up acids and using something so different like NAAP instead, but it really makes so much sense and I can personally attest to how much better my skin has been without strong acids, even before this came along. I think with all the amazing products out there we are overloading our skins and I want to go back to when I used acids on a weekly basis, not daily and just when my skin needs it. I still love the Bravura 2% Salicylic Acid Peel as there’s nothing like it for quickly healing blemishes but as far as Glycolic (my skin has never liked Lactic) is concerned I will only use the Votary Toning Serum when I feel like my skin could use something like that. I know that when your skin is freaking out it can seem like using more acids (or higher strength ones) will solve everything but I have heard from so many of you how either your skin has become highly sensitized from too much acid use or your skin has been better from using acids less, so clearly it’s not the right problem solver for everyone. I’ve realized how important it is to treat my skin gently and ever since I started doing that it’s been better than ever. Calm, balanced, less reactive, nourished and just normal. I definitely believe that exfoliation is important but I think some of us in the skincare community have been overdoing it a bit and I’m ready to care for my skin in a better way now and NAAP is going to help me do exactly that. 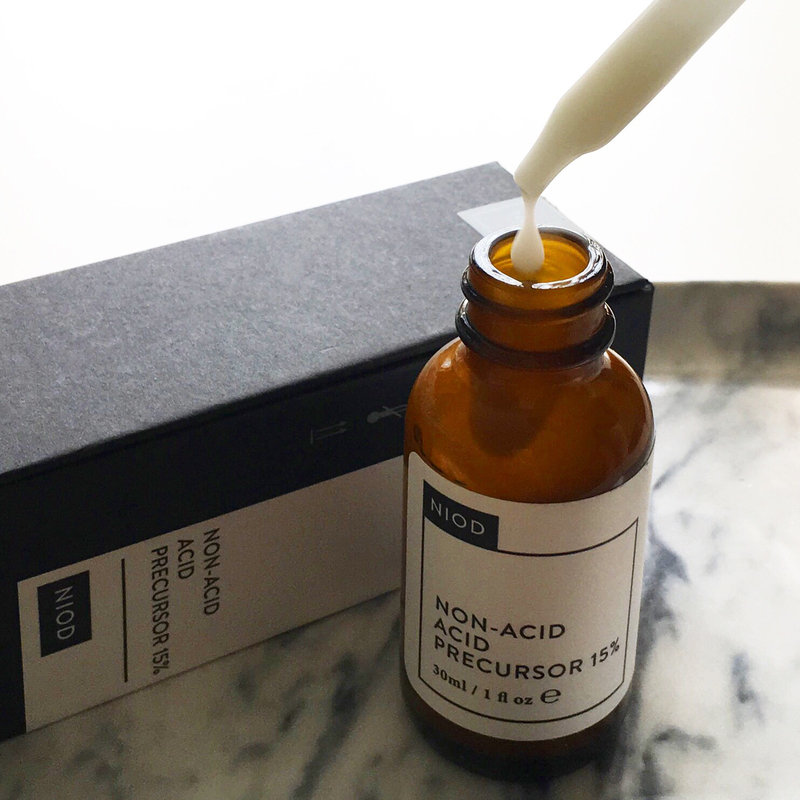 Non-Acid Acid Precursor 15% is $55/£35 for 30ml and is available HERE. What do you think about the Superoxide mist? I’m thinking of doing a deciem purchase and was wondering if it was worth it…that and the fractionated eye thingee? You really should! It’s amazing! This is exactly what I needed to read! I’ve been using a BHA for a year and my skin has been great. The company discontinued it and now has a higher strength BHA which I’ve been using but my skin is a hot mess! I can’t even remember the last time I was this blotchy and pimply! I was thinking of getting the NAAP because I’m hooked on The Ordinary so NIOD naturally has to be great too, right!? My skin is typically very sensitive and I get a major amount of dry skin buildup, so something that sloughs it off is much needed. Your review makes the NAAP sound like exactly what I’m looking for! Thanks for the detailed review! I am very confused about the information I’ve been reading on thison the internet. On the Deceim website in one of the comments Deceim says that this product is NOT a replacement for retinoids, only acids? I know what comment you are referring to and they are discussing Retin-A, which is a retinoid used specifically for acne treatment and is different from other retinoids. NAAP is not a replacement for that type of ingredient/product and in the case of someone who uses Retin-A, NAAP would only serve as an acid replacement.